With entertainment seeded in Roger Cairns probably from birth, it was a journey to get to jazz with many roads leading along the way, but all adding up to a versed, seasoned performer. Roger was born in the small coal mining village of Gilmerton, a suburb of Edinburgh, Scotland in 1946. Not surprisingly, Roger’s talent and his penchant for music were neither nurtured nor welcomed by his family in a post-war Britain more concerned with survival than entertainment. station, Radio One, and landed on the front page of the then best-selling music paper, Melody Maker. Listen also performed at the Queen Alexandria Hall in Kensington on the occasion of future Prime Minister Tony Blair’s nineteenth birthday. enjoyed radio airplay across the dial in the UK, and garnered widespread coverage in national and regional dailies. He fronted Roger Berteau & the Radiomen, released a couple of singles on the Hollywood label under the stage name John Laine, and landed an interview and performance on BBC TV’s nationwide Breakfast Time morning program. He was also a guest on Richard Baker’s celebrated Start the Week Radio 4 program. With all of this diversity and range of experiences, how did jazz become a part of the Cairns journey. In 1992, he auditioned with the LA-based Dirk Fisher Big Band, he signed on, and performed with the band until 2005. Though the sheer exhilaration of fronting a big band performing swing continued to gratify Roger immensely, he could not resist the draw of leading a small group. Hence the freshman release of A Scot in LA and now his sophomore effort, Let’s… So many of the tracks were standouts that our best suggestion is to click the latest hits button and check him out for yourself. Below are a few of my thoughts about the CD. After the rubato intro “They Say It’s Wonderful” is given a nice Samba treatment with a great tenor saxophone solo provided by Matt Otto that brings to mind the melodicism of the great Stan Getz. Cairns statement of the melody is in the pocket and is full of class. A light hearted “Bye, Bye. (Peter Gun Theme)” gives the CD a great moment of levity. However, there is still serious music happening here from the arrangement penned by Gary Fukushima and sung with great accuracy from Cairns. The selection has great orchestration, voicings, and solos and Cairns delivery of the witty lyrics is full of humor and satire. This really captures the insane feelings of a troubled relationship that once it is over, the comedy of it all can be seen and felt. “How Am I to Know” is a beautiful bossa nova the Cairns mater voice plays with and delivers the storyline with style and class. Cairns use of bends into various melody notes is very effective in giving the melody interest. Matt Otto again, provides another great solo, this time taking the listener on a colorful journey of sixteenth notes. 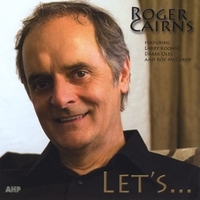 Let’s is a delightful journey from track to track with the one common theme being Roger Cairns, masculine, believable voice tying each element together to create a unique vocal outing. Well worth the listen, well worth adding to the collection.